In 1831, Donald McLean, Peter Grant, Donald Martin, John Kennedy, and Mr. and Mrs. Alex McBain sailed from Greenock near Glasgow to Montreal. The four latter remained in Glen­garry for the first winter. McLean and Grant came to Crook’s Hollow where they worked during the winter of 1831-32. In the spring they travelled by way of Galt to Elora where an Indian took them across the river for a penny apiece. They decided this land was too far back so they went back to Guelph and down the Brock Road, which was then only an ox trail, to the southern end of Puslinch. Here they met two choppers who took them to Stahl’s, Lot 35, R. Con. 8. Mr. Stahl went with them to look over lots. Donald McLean chose Lot 31, F. Con. 9. Peter Grant chose Lots 29 and 30, R. Con. 8. They built a shanty on McLean’s lot and lived there together. They cleared some land and sowed fall wheat on two of the lots in 1832. In 1832, Donald Martin, John Kennedy, and Mr. and Mrs. McBain followed them. They all lived together in McLean’s house, Mrs. McBain taking care of the house. This was the first house in Badenoch. In 1833, the Peter McLean, John Clark, and Kennedy families arrived. These were followed, in the same year, by more friends and relatives, and in the next few years most of the lots were taken up. Within a few hundred yards of the spot where this picture was taken, the emigrants of the 1830’s built a memorial cairn before leaving their native land for Canada. From an old list preserved by Wm. Leslie, grandson of Wm. Wade Leslie of Puslinch, we find the names of the following Badenoch men‑George McLean, John MacEdward, Wm. Martin, Alex Watson, Duncan MacEdward, John McLean, Donald MacEdward, George McLean, Peter McIntyre, James MacEdward, Alex McLean, Duncan Martin, Robert Clark, Angus Clark, Robert Kennedy, Robert Forbes, Lauchlan Kennedy, James Martin, James Martin Jr., Charles McCrea, Thomas 0’Rourke, James Gordon, John McDonald, Angus McLean, Alex Kennedy, James McDonald, Allan McDonald, John Little, Duncan Campbell. Lt. Col. Wm. Nicoll was prominently associated with the 11th Field Battery for many years. A soldier’s Memorial Monument was erected by the people of Puslinch on the Township grounds at Aberfoyle and unveiled on June 3, 1920, in memory of those who served and died in the war of 1914‑1918. Alexander McLean gave up his life for his country. In 1945, on the return of the forces from Overseas, a banquet and presentation was held in their honour at the Township Hall, Aberfoyle. On June 3, 1949, a Memorial Service was held at the Monument in the Township grounds, Aberfoyle, for those who served and died in the 1939‑1945 World War. School house 18' square to be hewn inside and well plastered inside and outside with lime. Floored with 1¼ " flooring, the floor to be laid tongue and groove or matched, but not planed. Writing desk for school house 12' long, ordinary height and breadth, also two benches 12' long. Suitable writing desk three forms for sitting 6' long. A desk for teacher with lock and key and a stool to sit on. Three windows of 12 lights each 8" x 10" to be set horizontally, one window on each side and a door at the rear with a strong lock and key. The house to be well shingled and the roof to be what is called a pavilion roof. The ceiling to be closed with lath. The work to be finished in a workmanship manner and to be passed by competent judges when done. Twenty‑eight dollars to be paid as soon as the job is finished, and the rest as soon as the section is taxed by the Council and the cash got from the treasurer. To be finished on or before the 7th day of August, 1843. This school was built on Lot 33, F. Con. 9. Several residents of Rear Con. 9 and Con. 10 signed a petition to the Municipal Council of Wellington District (Puslinch Council still has this petition), requesting help in completing the 10th Concession road for the convenience of the residents and as a preliminary to having the new school house built on the 10th Concession as this would be more central. A special committee appointed to examine the school site in S.S. No. 9 reported that after carefully examining the situation of the present school house they would recommend that the new school be built as near the centre of the said school section as practicable so that all parties may have, as near as possible, an equal distance to travel to said school and that said school section be assessed this year for building a new school house as the present one is altogether too small to accommodate the number of pupils attending it. But your committee would further recommend that action on the matter be postponed until after the present session of Parliament as a new school bill will likely be passed, which may affect the matter very materially. On June 18, 1850, a by-law was passed taxing S.S. No. 9, Puslinch, the sum of £50 for building and furnishing a new school house. Shortly after 1850, a new frame school was built on Lot 31 F. Con. 10. From 1846‑1849, Wellington District Council established various School Sections in Puslinch and passed by-laws relating to the assessing and taxing of these sections. After 1850, the Township Council had control. In 1852, Puslinch Township By-law No. 54 established 12 sections. Badenoch was School Section No. 9. In 1898, Badenoch was looking after its own school affairs. In 1948, several of the schools joined together to form the Puslinch School Area, managed by 5 trustees and a secretary. According to an old school record of 1880, there were 93 pupils on the roll. Mr. Jas. E. McLean was the teacher. February 11, 1851 shows £69-17‑3 for the teachers of schools in Puslinch. In 1898‑Annual salary paid teacher was $400. In 1922‑Annual salary paid teacher was $1,000. The present stone school was built in 1889, on the same lot directly behind the frame school. It has been remodelled and modernized. This school was closed in December of 1964 and the beginning of 1965 saw the children transported by bus to Aberfoyle. The following October the school was taken over as a Community Centre. In 1834, Mr. Thomas Wardrope, a licentiate of the Church of Scotland, settled in Badenoch on Lot 35 R, Concession 9. At this time, there was no church in East Puslinch. People held religious services in houses, barns, and sometimes in the open air. These services were conducted chiefly by Mr. Wardrope who played a worthy part in giving Presbyterianism its start in the township. Mr. Wardrope continued to conduct the services until the first minister, Rev. Wm. Meldrum, took over on March 11, 1840. In 1839, the congregation began to look for a pastor, but they were few and the fields many. Mr. James Gordon, who lived in the lower end of Badenoch, was acquainted with and recommended Wm. Meldrum, who had just completed his college course in Scotland. A petition was sent across the waters to him, which he accepted. He was ordained by the Presbytery of Hamilton in 1840. For his first service, conducted in Gaelic, he chose as his text I Cor. 2:2. Rev. Meldrum made his home with Peter McLean, Badenoch. On Christmas, 1845, he married their youngest daughter, Anna. They had eleven children. In 1845, he secured a farm, Lot 33F. Con. 8, which he owned until his death. In 1852, he went to Vaughan, York County and later to West Zorra. He returned to Morriston in 1871 where he lived until his death in 1889 at the age of 83. His work in Puslinch will never be forgotten, as he entered sympathetically into the struggles of the early settlers and took a conspicuous part in laying the foundation of Presbyterianism in their midst. On Sunday, June 25, 1967, a plaque was unveiled in Duff’s Church in memory of Rev. William Meldrum, by his grand­daughter, Elma, Mrs. George Gibbs. Alexander McLean helped build the corners of the first church. Donald McLean and Alexander Nichol were on the first cemetery board. In 1838, Donald McLean was appointed Vice‑President, and Lauchlan Kennedy, Secretary of the Presbyterian Association, really the first board of management. James Gordon recommended Rev. William Meldrum for the first minister. Lauchlan Kennedy was one of the first elders and a member of the Session for almost 60 years. He was the first precentor in both Gaelic and English. He held this position for 44 years. When nearly 90 years of age, he still led the singing at the Gaelic Communion Services. James McLean was appointed Treasurer of the board in 1863 and held this office for 30 years. When Mr. Meldrum was pastor of the congregation, and lived in Badenoch at the home of Mr. Peter McLean, he used to invite the people for Sabbath instruction after the regular service of the sanctuary. Although there was no formal organization, these Sabbath classes may be regarded as the origin of the Sabbath School which still exists. When the old log school house stood on the 9th Concession it was too far from the centre of the section, so a summer Sabbath School was held near the Badenoch blacksmith’s shop, in the open air beside a large pile of logs, arranged for seating accommodation. Mr. Angus Clark opened and closed the meetings with prayer. His co‑workers were Messrs. Peter Grant, Dutton and James McLean, public school teacher, who taught a class of boys in the Gaelic language. The first Superintendent was Lauchlan Kennedy who always used the Gaelic in prayers. The next Superintendent was Mr. Robert Goudy, who introduced the singing of hymns in the Sabbath School. The next to hold this office was Mr. Jas. E. McLean, who also conducted Sabbath evening meetings during the winter months. He was succeeded by Mr. Dugald McDonald for a short time. The next was Mr. Wm. Stratton and then Mr. Wm. Patterson. Some of the teachers were Jas. E. McLean, John W. Kerr, Mrs. J. R. Clark, Mrs. Geo. Hanning, Miss Jessie McLean (Mrs. McLean) and Lizzie Kerr (Mrs. Donald Hanning). John Elliot was the local shoemaker. He lived on Lot 34 R. Con. 8 until he moved to Morriston. John Campbell also carried on the shoemaking business on Lot 31 F. Con. 10, where the present ball park is. Hugh Fraser was here in 1891. The shop was closed in 1904. A heading and shingle mill was on Lot 35 F. Con. 10. Rev. Dr. Thomas Wardrope, son of Thomas Wardrope of Lot 35 F. Con. 9, was one of the first students at Queen’s College, Kingston. He made the trip to Kingston in a wagon with his trunk for a seat. He was in Kingston when the college opened March 1, 1842. In 1845, he was ordained and inducted pastor of Knox Church, Bytown. He remained there for 24 years, then came to Chalmers Church, Guelph. He retired in 1892. At one time he was Moderator of the General Assembly of the Presbyterian Church. Rev. John Little and Rev. Andrew Little, sons of John Little, Lot 28 R. Con. 10. Rev. Peter McLaren, son of James McLaren. Don. R. McLean, son of Alex. McLean, Lot 30 R. Con. 9. Sir John Eddington, son of Mr. Eddington, Lot 36 R. Con. 8. Peter McLean, son of Alex. McLean, Lot 30 R. Con. 9. Hugh Scott, son of Andrew Scott, Lot 33 F. Con. 9. Angus Clark and Donald Clark, sons of Donald Clark, Lot 27 F. Con. 9. As well as the above, there have been many nurses, teachers, bankers and office workers. The first post office between Hamilton and Guelph was established at Puslinch on February 6, 1849. Squire Leslie was the first postmaster. In 1850, a passenger and mail coach service was set up, leaving Hamilton at 8 a.m., arriving at Guelph at 4 p.m., when another coach left Guelph arriving at Hamilton at midnight. With the coming of the railroad, the train was the chief method used for the conveyance of mail, leaving mail at Puslinch Station (formerly Schaw Station) twice a week, This has gradually been replaced by the motor vehicle which today brings the mail to Puslinch. Prior to the inauguration of Rural Routes, people had to call at the Post Office for their mail. Service was given either through post office lock boxes, which were rented, or through General Delivery. R.R. No. 1, Puslinch was established April 1, 1913. This route brought mail to Badenoch for the first time. R. Maddaugh was the first courier, making the 21 mile trip, travelling north on Concession 9 and south on Concession 10, six days a week. Since then mail has been delivered by George Butcher, Oliver Monkhouse, J. A. McPherson and Wes Winer. The first mention of a telephone in Guelph is of a demonstration staged in the Montreal Telegraph Co.’s office, when a telephone conversation was held between Guelph and Stratford. Singing was also transmitted. This was on September 15, 1877. On August 14, 1879, Charles Raymond signed for two hand telephones for use between his office and workshop. In 1880, when the Bell Telephone Co. took over, there were eleven subscribers. Early in the 1900’s, a rural line was built along the Brock Road from Guelph. In 1913, telephones were installed in many Badenoch homes. Our central is Guelph. In 1925, Hydro Electric Power Commission first began supplying power along Highway No. 6. In 1948, Badenoch homes received hydro power for the first time. To the early settlers the forests were a challenge. They had to be cleared before farming could be carried on. Every spare moment was spent in this seemingly endless task. The towering pines and lordly maples fell before the woodsman’s axe. Rails were split and saw mills set up. Now, over a hundred years later, we can see the important part trees play in our economy as a protection against erosion and drought as well as a cash crop. Now our thoughts and actions turn to replacing and conserving our forests. Conservation originally had to do with the pro­tection of forests because of their importance as a source of revenue to the province, but allied with this, we now have the problems of forest management, wildlife and the protection of source areas of rivers and streams. As in all of Southern Ontario, Badenoch was interested first in reforestation and woodlot management, second in flood and pollution control. In 1945, one hundred acres, F. Lot 31, Concession 10 were purchased from Wm. Black. The rear fifty acres of this lot was bush and swamp land with a spring-fed creek running through it. The front half has been reforested with spruce, pine, and a few deciduous trees. In 1946, fourteen thousand trees were planted; in 1947, five thousand trees, and in 1949, three thousand trees. These trees have grown well and provide homes for many kinds of wild birds and animals. Hunters from far and near spend many enjoyable hours here. Flood control is considered the responsibility of the community of the stream valley, so the Conservation Authorities Movement was born. In the past 18 years, 30 Authorities have been established, with a total membership of 438 municipalities and an area of 19,535 sq. miles. One of these was The Twelve Mile Creek Conservation Authority, which was established by Order in Council on June 12, 1958. In 1960, several potential reservoir sites were examined and described in The Twelve Mile Creek Conservation Report 1960. The Mountsberg conservation site is located on a tributary of the Twelve Mile Creek which rises in Badenoch F. Lot 29 Con. 10 and runs through the section before entering East Flamboro township. A dam 12 ft. high and 1300 ft. long has been built across this creek. The reservoir thus formed in 1967 will be used for flow regulation in summer after impounding the spring run‑off. It will be left empty during the winter. It is hoped that this will raise the water level on the surrounding farms and supply a constant source of water for irrigation on the farms south of the reservoir. On August 7th, 1934, at the suggestion of Ann McLean, the Badenoch Women’s Institute was organized by Mrs. J. A. Carleton and Mrs. G. B. Richards. President, Margaret McLean; 1st Vice‑President, Velma Beaton; 2nd Vice‑President, Penelope McLean; Sec’y.‑Treas., Florence Elliot; Assistant Sec’y‑Treas. and Press Reporter, Mary Hanning; Directors, Margaret MacEdward, Mrs. D. Simpson, Mrs. A. Buchanan. Our meetings were held the first Tuesday of each month at two o’clock, unless otherwise stated. The membership fee was 25¢. The motto of the Institute is “For Home and Country”, and through the years it has been the aim of the Institute to help locally and farther afield. We sponsor a homemaker’s club and are pleased to have girls win county and provincial honours. These girls were presented with a gift from the W.I. We also give books to pupils graduating from public school. We have always contributed to the local school by donating supplies for social gatherings, as well as money to the community centre. We have given financial aid to the local ball team and fair boards as well as to charitable organizations. Educationally we have taken advantage of the short courses and leader training schools put on by the Department of Agri­culture, Institute Branch. We are members of the Historical Society of Wellington County who are doing good work in preserving historic buildings and local history. This being Centennial Year, we had as projects: putting the new flag in the community centre and erecting a name sign at the crossroads. We celebrated several anniversaries, the last being our thirtieth in 1964, when previous members joined in helping to make it an enjoyable afternoon, with Mrs. R. C. Moffat giving her usual stimulating talk. Corsages were presented to guest speakers and an anniversary cake was cut by Mrs. Murray Mahon, 1st Secretary and Mrs. Bert Wright, District President. Also in connection with this celebration, a life membership pin was presented to Margaret McLean. Our annual bus trips have been a source of enjoyment as we visited many interesting places. The members are mostly responsible for preparing the programme of each meeting which helps bring out hidden talent, but guest speakers have been many. From the time of the earliest settlers, a competitive spirit seems to have prevailed. There were wood sawing and chopping, sheep shearing and dipping bees. At the barn raisings two captains were chosen and they picked their teams for lifting and placing the timbers. The ladies set up tables to feed the men and produced the finest in baking. The first plowing match in this district was held on the 17th of October, 1855, at what was known as Pinefield Farm, the home of Peter McLean, Lot 31 Front 9 Con. The judges were Alexander McBain of Baile Mhonaidh, Malcolm McKenzie and Donald Martin. The prizes went to the men as follows: 1st‑Walter Moffat, 22s. 6d. ; 2nd‑Charles Mc­Intosh, 17s. 6d. and 3rd‑Malcolm Clark, 12s. 6d. Boys: 1st‑Arch. McLean; 2nd‑Peter Hanning and 3rd‑Peter Grant. Their prizes were the same as for the men. In 1899, at the Dominion Day celebrations in Guelph, a team of Puslinch men pulled a team from Erin in the tug‑o‑war event. On that team were two Badenoch men, D. A. McLean and D. R. Clark. 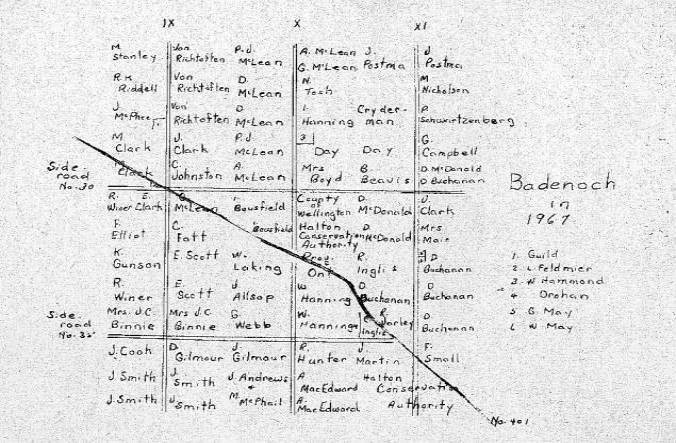 Speaking of tug‑o‑war, on May 24th, 1902, at a field day held at the home of Alex McLean, North Badenoch (Tus­carories) pulled South Badenoch (Weasles) in a duel that lasted 55 minutes. Football was played around this time and again the teams were designated as North and South. For a time hardball was played, but with no organization as of today, the games were with neighbouring communities. In 1920, girls’ softball came into prominence. These again were challenge games with the surrounding rural districts. In the early forties, the boys turned to softball in which they have excelled ever since. In 1954, under the guidance of the late Robt. D. Hanning, the boys won their first O.R.S.A. Championship. In 1960, they won their second “C” champion­ship and repeated this feat again in 1963. As far as we know, they are the only team to have their name inscribed on the “C” ­trophy, three different years. They then turned their thoughts to the “B” trophy, which they won in 1964. In that same year, they won the Puslinch‑ Eramosa league cup, as did our “Jr.” team. The O.R.S.A. is the Ontario Rural Softball Associ­ation. The Township Council donated trophies and money in recognition of the honour which they brought to Puslinch Town­ship. Each year, at the close of the ball season, the Community honours the boys with a Turkey Supper. Boys and girls from this district began participating in 4‑H work in 1944. Their animals and produce were exhibited in special classes at Aberfoyle Fair. The best of these went to Erin Fair, and later still, the finest of the produce and the animals that made the required gain, were in competition at the Royal Winter Fair in Toronto. Our young people received a very fine training from the 4-H, and won some trophies and prizes. Later some joined the Jr. Farmers’ Club. Regular classes were held in Badenoch School for the last time in December of 1964. In January 1965, S.S. No. 9 pupils began classes at Aber­foyle. In March of the same year, discussions began concerning establishing Badenoch School as a Community Centre. Later a delegation from Badenoch attended a Township Council meet­ing regarding this. A petition signed by more than 50 % of the ratepayers in the part of the Township affected was required and 76 % approved. In the autumn of 1965, the title was transferred to Badenoch School under the Jurisdiction of the Township of Puslinch and the Community Centre was born. In 1915, the Puslinch Branch of the Canadian Red Cross was organized. The Badenoch group was known as the Bade­noch Khaki Club. They were very active in knitting and sewing and packing boxes for the girls and boys overseas. In 1940, it was reorganized and continued along the same lines. Since the end of World War II, Badenoch has given financial assistance to the Puslinch Branch. There is a loan cupboard in Morriston where anyone in need of supplies can obtain them. Many of our Badenoch children went to the Y.M.C.A. in Guelph, to attend swimming classes sponsored by the Red Cross. One year before July 1933, the many descendants of the early settlers of Badenoch decided that it was only fitting that we should celebrate the 100th Anniversary of the coming of our forefathers. P. C. McLean was appointed Secretary, D. J. McLean, Treasurer. The following were named as a committee to make arrangements for the occasion: P. Campbell, D. Buchanan, D. McDonald, D. G. Hanning, P. J. McLean, D. MacEdward, D. McLean, G. Clark, J. Scott. Although one hundred years had passed since the first people had settled here, these men were almost all descendants of the original settlers. 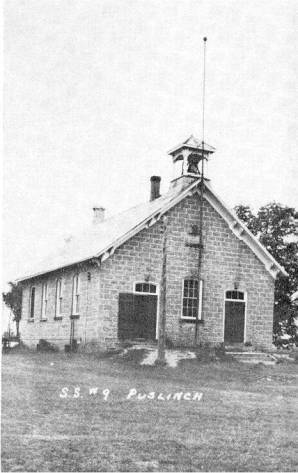 The Centennial was held at Badenoch School House July 26th, 1933. Ideal weather attracted a crowd of nearly 3,000 residents and former residents of Badenoch. The afternoon was spent watching ball games and renewing acquaintances. The bountiful supper, supplied by the ladies of the community, was followed by a program. Duncan McLean was chairman. Speeches were given by former Badenoch residents: Rev. John Little of Rockwood, Dr. Donald Clark, Grimsby and Wm. Patterson, former teacher of Badenoch. Piper McPherson and the Guelph Pipe Band added to the enjoyment of the evening, which ended with a dance on the platform set up in the school­yard. The following Sunday, outdoor worship was held in the schoolyard, and service was conducted by a former Badenoch resident, Rev. John Little of Rockwood. The above barn on Lot 31, F. 9, on the property of Mrs. D. J. McLean, was built in 1898. Before 1877, this lot was owned by Mr. J. Pelley. Then it was owned by Andrew Ord and later Robt. Ord. At the present time, the owner is Mr. Stanley Michael. Previous to 1877, this lot was occupied by a Mr. Tate. According to the 1877 atlas, a Mr. Fowler lived on this property. Around 1877 John McPhee bought this lot. He and his wife, Emma Dixon, had a family of 5 sons and 4 daughters. On the death of John McPhee in 1917, the farm passed to his son, James. James married Lillian Biggs. They had a family of 5 daughters Jean (Mrs. Del. Biggs) Edna (Mrs. Silkstone), Ruth, unmarried; Lois (Mrs. Riddell), Eunice (Mrs. Sharkoff) and one son, John. James sold to his son‑in-law, R. K. Riddell. The Riddells have 1 daughter, Wendy, and 3 sons, Alan, Chris and James who are the 4th generation. In 1967, the big stone house, which had been erected by John McPhee and 12 acres of land were sold to Mr. Turner. The Riddells and Mr. and Mrs. McPhee are presently erecting new homes at different locations on this property. Robt. Ord, who was born in Berwickshire, Scotland, came to Canada in 1850 and settled on this lot. He was a blacksmith in Scotland. He married Mary Edgar in Scotland. Their family was Mrs. Len Tait, David, Robert, Mrs. John Black and Mrs. David Petty. Andrew was 20 years old when he came out with his parents in 1850. He was a land surveyor. In 1879, he sold Lot 28 and moved to Lot 24. He also owned Lot 26. He married Flora McLarty. Their family were Robert, John A. and Mary Jane (Mrs. Jas. Black). Following the Ords, this property was occupied by Peter Clark (brother of James on Lot 31 R. 8). Peter Clark married Mary McKenzie. They had 2 sons, John and Duncan, and 3 daughters, Annie (Mrs. Campbell), Isabel (Mrs. Robt. Murray) and Cassie (Mrs. H. Donavon). This property was then owned by John McPhee, and then his son James, who sold to his son John. John built a house on this location, which he sold along with 10 acres of land to Mr. and Mrs. Guild. John married Joan Hudson, and their family are Kimberly and Mathew. John Clark Sr. farmed in Scotland and came to Canada with his wife and family in 1833. He settled on Lots 29 and 30, rear of Concession 8, Puslinch Township. His brother‑in‑law, Peter Grant took up this land for him the previous year (1832). He married Mary Grant in Scotland. He had the first team of horses in Badenoch and the first stone house built in the com­munity. Malcolm, the only one of the family born in Canada, was born on old Hallowe’en 1833, and was the first white child born in the Badenoch settlement. He succeeded to the old home­stead of 200 acres, where he was born. He married Marjory McPherson. Their family: Angus, Donald, Peter, John, Annie (Mrs. Peter McKenzie), Margaret (Mrs. Dunc. McLean), Molly (Mrs. John Clark). John M. was born and raised on the home­stead, which he operated. He married Eliza, daughter of Benjamin Jacobs of Morriston. Their family: Mary Vernice (Mrs. Telfer) (d), Marjory (d), Malcolm, Gladys (Mrs. Hanning), Ben (m. Mildred Munch), John (m. Christina McLean), Edith (Mrs. Hull), Alberta, Donald, Howard. On the death of John, in 1943, his son Malcolm took over the farm. He married Donalda, daughter of Donald J. McLean. Their family, Helen, John and James are the 5th generation, and still live on the old homestead, in the original stone house. In 1959, the MacDonald‑Cartier freeway was built, going through part of this farm. Since then, the Clarks have sold two lots on the East side of the highway, one to Mr. and Mrs. Feldmeier, and the other to Earl Blacklock, Morriston. Peter Grant, who came to Canada from Scotland in 1831, chose this lot for his nephew, John Clark Jr., in 1832, Clark having remained in Scotland until 1836 to finish his schooling. Grant named this farm “Fernhill” and it was bought from the Crown in 1846. John Clark, like his ancestors, was a Presby­terian and one of the earlier Elders of Duff’s Church. He married Isabel Cameron. John Clark died in 1911, and his wife had predeceased him December 28, 1883. They had three sons. John married Molly Clark. They farmed at Marlette, Michigan, U.S.A., where many of their descendants still are. Peter married Mary McKenzie and they lived near by. For many years of his later life, Peter delivered mail on R.R. 1, Moffat. James married Margaret Dalgarno and they remained on this lot. James Clark passed away March 11, 1941 and his wife, Margaret July 7, 1940. Their children were Grace, who died in infancy, 1897, Ernest, a veteran of World War I, died April 10, 1950, James, killed in action at Chambrai, France, October 1, 1918, Mrs. William A. Moore (Isabell), Aberfoyle, Mrs. John G. McLean (Christina) (widow), Aberfoyle, Mrs. Stewart Allan (Grace) (widow), Guelph, Mrs. Archie M. Scott (Mary) (widow), Guelph. George remained on the farm with his father. George Clark married Irene McCarthy and their family are Mrs. Shepherd (Margaret), Barrie, Miss Margaret Elizabeth (Betty) Clark, Guelph; Mrs. Tompkins (Dorothy) (“Tiny”), Hamilton; Miss Mavis Marie Clark, Hamilton; and George Eric, their only son who still resides on the farm with his wife, the former Barbara Button and their children Cynthia Marie, Randell Dalgarno, Rodney Thomas, and Shawna Lee. George Clark died June 13, 1957. Mrs. Clark resides in Hamilton. Lot 32, R. 8 was taken out of the Crown by Alexander McBain, February 18, 1862. Mr. McBain died in 1871 intestate and the land went back to the Crown. Following this, Joseph and Janet Grant lived there for a period of time. In 1880, the farm was put up for public auction at Guelph, by the Crown, and was bought by Andrew Elliot, who rented it to Jack Wyse for a few years before he went to live there himself. In 1908, he bought the 50 acres behind it from H. A. Stewart. In 1925, Andrew Elliot died and in 1926 the farm was taken over by his son John A. and daughter‑in‑law, Jennie May Elliot. Their family are Stewart (married Jessie Job), Frank (married Mary Hanning), Florence (married Murray Mahon), and Murray (married Joyce Taylor). John A. Elliott’s son, Frank bought it from him in 1948, and he and his wife, Mary, are the present owners. Their family are Ivan (married to Elaine Strong) now living in Sault Ste. Marie, and Brian, at home. Andrew Elliot (married Mary McKenzie). Their family: John A. (married Jennie May Campbell), Agnes (married Andrew McEdward), Margaret (married Ernest Walker) moved to Alberta, Albert (deceased (flu), 1919), Bessie and Maude (not married). Barney Mast and people by the name of Gregor lived on this lot before 1866. In 1866, Lot 33, R. 8, was taken out of the Crown by the Martin family, (Mary, William and Susannah). William Martin bought it in 1885 and he and his wife, Susan, raised their family there (Anna, Mamie, Cecil, Olive and Verna). After his death in 1952 and his wife’s, some years later, the farm was owned and operated by their daughter Olive, her husband, Hugh Lasby, and daughter Patricia. After Olive’s death, it was sold to the present owner, Kenneth Gunson, in 1962. He and his wife, Audrey, live there with their two children, Ronald and Suzanne. Lot 34, R. Concession 8, purchased from the Crown by Malcolm Clark (Yeoman) in 1850 and consisted of 100 acres. After his death the farm passed to his son, David, and wife, Helen McKenzie. Their family: Meldrum, who died a young man: Annie (unmarried) and Jean (Mrs. John House). In 1889, Wm. Nicol bought this farm from the Clarks and built the present barn in 1900. It was during this time that Jack Elliott (shoemaker) had a shop on the front of this property. Wm. Nichol had the house on the farm dismantled and shipped to two of his sons, Wilbert and George who had home­steaded to West Riverhearst, Sask., for their own use. At the death of his father William, another son, Ernest, took over the farm and built the present house in 1933. He sold the farm to Elmer Gravelle in 1945, who later sold it in 1949 to Roy Winer, the present owner, a dairy and mixed farmer. Roy farms with the help of his wife Evelyn and their five children, Barbara, Brenda, Debbie, Donna, and Jayne and father‑in‑law, Andy Gilmour. Andrew Stahl was located on this lot before any other settlers in the district. He purchased this property from the Government in the early 30’s, made a small clearing and erected a log house. Peter Grant and Donald McLean went to Stahl’s house in 1832 when they were looking for a location. He directed them to the north where they secured lots on 8 and 9 Concession. In 1834, he sold his lot to Alexander Nicoll. Alexander Nicoll was born in Forfarshire, Scotland in 1786 and died in Puslinch in 1860. He married Mary Alexander in Scotland; their family, Elizabeth (Mrs. Knowles), Mary (Mrs. Wm. Ross) and Lt. Col. Wm. Nicoll. He, fifteen years of age at his father’s death, continued on the homestead. He was active in Militia circles and held many municipal offices in Puslinch. He married Jane McFarlane, and their family: Maggie (Mrs. McPhee), Alex A. Stewart, Mary (Mrs. Dr. King), George L., Ernest, Wilbert R., and Jessie E.
On the death of Col. Nicoll in June, 1921, the farm passed to Alex. In 1955, Alex sold the farm to Mr. Campbell, who then rented to Mrs. Kidd. Mrs. Campbell sold to Mrs. Bennie, the present owner. In January 1848, Mr. Peter Edington obtained this lot from the Crown. You will find reference to this gentleman in another part of the book. A Mr. Jas. Macklem acquired this property in May, 1857. He sold in 1878 to John Sparkes and moved to Michigan. Next we note that in 1902 this property was bought by John Inglis, which be retained until 1909, when he sold to George F. Smith. In April, 1919, the property again changed hands and we find that Lawrence Walker was the new owner. He, in March of 1921, sold to Alfred Wilkie. He in turn sold to Clare Tromby in February, 1923. In February of the same year, we note Alice Thurston as the owner. In December, 1924, this property was purchased by Cecil Martin. After his death the property was purchased by Chas. T. Cook and wife, Rose. They had 3 daughters and 2 sons: Bessie (Mrs. Cordier, Boston), Corrine (Mrs. Porter, Detroit), Bernice (Mrs. Jamieson, Guelph), Charles (married June Diller, London) and James. After the death of Charles “Sr.”, James inherited the farm, where he and his mother still live. Archibald Watson born in Crieff, Perthshire, Scotland, came to Canada in 1831 and his family followed in 1834. He pur­chased rear lots 37 and 38, Con. 8. They were among the first settlers in Badenoch. On this property the Nicoll Bros. (no relation to the Nicolls on Lot 30) were cutting wood when Grant and McLean were looking for a site to locate their farms. Mr. Watson’s wife died in Scotland and his son, Robert, was 11 years of age when he came to Puslinch. Robert Watson married Elizabeth Bullock. They had a family of 6 sons and 4 daughters. 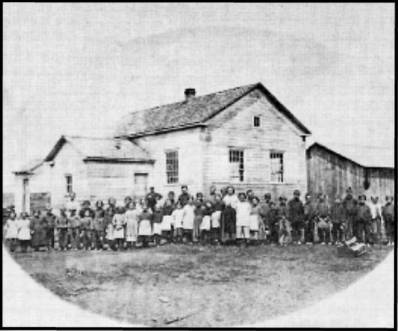 Most of these children went west and to the U.S. Frank, one of the sons, remained on the homestead. He married Eliza Lewis in 1903. In August of 1904, Robert was killed by a train which crosses this property. In December of the same year (1904), Frank died. Following his death, Geo. Lewis and Lylie Heath, married in 1902 and living in Aberfoyle, moved to the farm. Their family was: Charles married Mary Car­gill, Dorothy not married, Edna (Mrs. Harold Bell), Lila (Mrs. Jack Hayden) and George married Christine Mimmott. 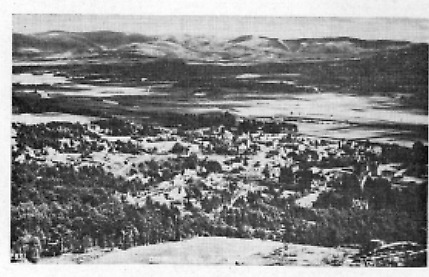 In March 1914, they moved back to Aberfoyle. The farm was rented to a Mr. Holmes for several years. When he left, Joe Smith rented for a number of years. After the death of Geo. Lewis in 1937, the farm was bought by Joe Smith in 1940. The Smith family: John, Peggy, Loretta, Helen and Lorraine (d). In November 1956, John took over Lots 37 and 38, which lies north west of the railway. In 1961, John took over the balance of Lot 38. In May of 1874 and October of 1881 parts of Lots 37 and 38, R. 8 were bought by Credit Valley Railway and is now C.P.R. According to the Atlas of the County of Wellington prepared in 1877, this property was owned by Andrew McRobbie, father of Mrs. Wm. Kerr. Peter Schultz then owned the property and removed the bush. There was a mill operated by Blacks on the west corner of the lot and later by Dawson Wheeler. He moved the mill to Beverly in 1904. Lumber for some of the barns in the section was sawed at this mill. In 1905, D. R. Clark bought this lot from Peter Schultz. There was a house on this property in which there were many tenants, among them John A. Ord and Haggertys. The house was later sold to Jas. Black and moved below Puslinch on No. 6 Highway. This lot sold in 1960 together with Lots 27 and 28 to Grant Campbell, who in turn sold it the same year to a German Syndicate. In 1841, Peter McPherson, known as “Linny” McPherson, came to Canada with his son‑in‑law John McPherson and settled in Badenoch Lot 28, F. 9. He married Annie Martin, a sister of Margaret (Mrs. Peter McLean). Peter’s family was one son, Angus, who was killed by a tree while cutting wood to build a house for his mother, and eight daughters. Anna (Mrs. John McPherson), Penelope (Mrs. Robert Kennedy), Elizabeth (Mrs. John MacEdward), Margaret (Mrs. Donald Clark), Mary (Mrs. John Campbell), Isabella (Mrs. John McLean), Janet (Mrs. Lodwich McRobbie) and later (Mrs. Chas. McIntosh), Marjory (Mrs. Malcolm Clark). In 1844, Peter McPherson left this property to Rev. Meldrum and Peter Grant. They sold in 1855 to Donald Clark (m. Margaret McPherson). Donald cleared this, along with Lot 27. Their family was: John D., Peter, Mary, Dr. Angus, Annie (Mrs. John McKenzie), Marjorie (Mrs. Jas. Simpson), Dr. Donald and Duncan R. Duncan R., known as D. R., born and raised on Lot 28, took over the homestead when his father retired to Morriston in 1895, and died in 1916. He, D. R. bought from his father in 1903. D. R. married Margaret J. McLean (daughter of Peter McLean). Their family: Marjorie (Mrs. H. Bailey), Margaret (Mrs. E. Cockburn), Annie (Mrs. Geo. Stewart), Janet (Mrs. Wm. Scott), Mary (Mrs. E. Gray), Emma (Mrs. R. Allan), Maude (Mrs. Donald McLean), Iola (Mrs. Frank Grieve), Donalda (Mrs. Grant Halls). In 1939, D. R. sold Lots 27 and 28 to son‑in-law Wm. Scott and retired to Morriston, where he died in December, 1945. His wife, now 92, still lives in Morriston. In 1960, Wm. Scott sold Lots 27 and 28, and at the same time Mrs. D. R. Clark sold Lot 26 to Grant Campbell who in turn sold to a German Syndicate. Scotts moved to Morriston in 1961. This farm rented to Heinz Richthoften for 2 years. Since 1963, Mr. and Mrs. J. Seifried and family of 4 sons have this property rented. There were settlers on this property at an early date but they apparently did not register the property. The records indicated Duncan McKenzie and his wife Ann McLaren as the first owners. Their family was Annie (Mrs. Donald Cameron), Christina (Mrs. Peter McLean), Margaret (Mrs. Donald, McKenzie), Mary (Mrs. Peter Clark), Bella (Mrs. Wm. Webb, Lucknow), and Ellen (Mrs. David Clark, Guelph). On the death of Duncan, Peter, who married Annie Clark, daughter of Malcolm Clark, took over the farm of his father. Another brother, John, married Annie Clark, daughter of Donald Clark. Because of ill health, Peter moved to the West. The farm was rented to Wm. McCrory for several years. He in turn rented to Jas. Clark. The farm was then sold to Peter McLean, son-in-law of Duncan McKenzie. Duncan McLean, son of Peter came home from British Columbia where he had been carpentering and took over the farm from his father. He and his wife, Margaret Clark (daughter of Malcolm Clark) had one son, Peter and three daughters: Marjorie (died in 1967), Christina (Mrs. Elgin Paterson, died in 1942), and the third daughter died in infancy. Duncan farmed until he retired to Morriston. The farm was then rented to John Clark. After the death of Duncan, his family, Peter and Marjorie sold the farm to John Clark and Christina (McLean) who still reside on the farm. Their family: Donald, Marlene (Mrs. David Usher) and Laverne. Donald Martin, brother-in‑law of Peter McLean on Lot 31, took over this property from Donald McLean in 1842. He had three sons, Angus, Kenneth and James. Angus married Janet McMillan, a sister of John McMillan, a framer. Their family was John and Mary. Mary is unmarried and lives in Galt. Around 1907, John Quillman bought from the Martin family. He lived there with his mother before marrying Fannie Elliot. There were two children, Richard and May. The Quillmans sold to Harry Munch and his wife, Harriet Atkinson. They had one daughter, Mildred (Mrs. Ben. Clark). The Clark family are Marjorie and John. Mrs. Munch sold the farm to Mr. and Mrs. Emerson Groshaw and their family Franklin and Mabel. The next owners we note are Mr. and Mrs. Bob Francis, who in turn sold to the present owners, Mr. and Mrs. Carman Johnston. Donald McLean was born in Badenoch, Inverness, Scotland, 1806. He came to Canada in 1831. He picked Lot 31, front of Concession 9. He turned it over to his father, Peter. 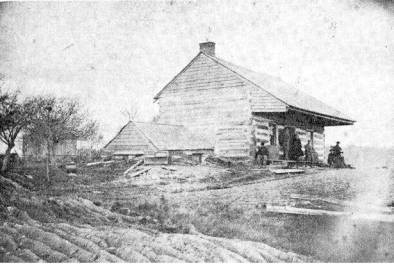 McLean, Clark and Kennedy erected a shanty on the McLean property. Mrs. McBain kept house for them for a year. They had their first crop of wheat in the fall of 1832. Later Peter turned the farm over to his son Peter, who turned it over to his son Donald J. McLean, who was the first child born in the house which was built by his father in 1869 and is still on the homestead. He married Ellen, daughter of Duncan Martin in 1905. Their family: Peter Gordon (married Gertrude Kerr), Mary (Mrs. D. Bell), Penelope (Mrs. McLeod), Donalda (Mrs. M. Clark), Jessie (Mrs. Gordon Small), James, and Anne, in Guelph. Mrs. Donald J. McLean still resides in the old home. The fifth generation, Peter Gordon and his wife Gertrude and their family, Donald and Audrey still live on and farm the homestead, while another son James (married Dianne Zister) lives in Guelph. In 1959, the MacDonald‑Cartier freeway was built through the farm dividing it almost in two. In 1846, Lot 32, F. 9 was taken out of the Crown by Peter Grant. Hugh Clark bought it in 1892 and in 1909 it was sold to Job. Revell. Then in 1913, his son Marshall Revell operated it. In 1915, it was bought by Andrew Scott. His son James became the owner in 1954. Recently it has been purchased by Chas. Fatt, who now lives there with his wife, Charlotte, and son, Murray. James Kennedy (the elder) who had four sons, William, Duncan, Alex and James, purchased the farm in 1866. Later his son, Jas. became the owner but turned it back to Jas. Kennedy Sr. in 1873, who operated it until he died in 1889. It was taken out of the Crown in 1891 for $200 by Wm. Kennedy who, in 1892, sold it to Andrew Scott (who was married to Mary McGeachy). In the same year, it was rented to Dan Kennedy for stumping a certain amount of land. Andrew Scott and his wife had eight sons, Wm., John, Ed., George, Donald, Archie (deceased), Jimmie, and Dr. Hugh (deceased). He himself died in 1941, and his wife, Mary, in 1952. In 1954, Ed. Scott became the owner and he still resides there with John, Jas. and George. It was on this farm that the first school had been built in the west corner. Also, there was a house formerly used by Angus McPherson and rented to George Thurston. Prior to being taken out of the Crown by Jas. Kennedy in 1886 for $175.00, it had been operated by he and his son, James Jr., since 1870. In 1891, Alex. and Wm. Kennedy purchased it and Andrew Scott became the owner in 1892. It is now owned and operated by his son, Ed. Scott. Lot 35, front Concession 9. In the early 1830’s a family by the name of Geddes lived here, also Eric Munch and Zip Parttoe, who framed the first barn raised in Badenoch. They were followed in about the year 1834 by Thomas Wardrope, a licentiate of the Church of Scotland. Mathew Elliot immigrated to Peterborough, Canada, from Roxburghshire, Scotland in 1831, as a young lad of nineteen. About 1835 or 36, he came to Dundas where he met Agnes Scott, also from Roxburghshire, Scotland, who came to Canada in 1834. They were married in 1836. In the summer of 1844 they came to Puslinch and took up Lot 35 front, Concession 9, obtaining their Crown Patent in 1848 for the sum of $300. There were thirteen children in this family, namely: William, Robert, Mathew, Margaret, Janet, Elizabeth, John, Agnes, James, Andrew, Johanna, Fanny and Walter. Upon the death of Mathew Elliot Sr. in 1898, the farm passed to his youngest son, Walter. Walter married Jessie Mc­Geachy Simpson, widow of the late John Simpson in 1896. They had one son, McMillan, and a daughter, Jessie, and a step­son, John Edward Simpson and a son, Mathew, who died in infancy. On the death of Walter in 1940, the farm passed to McMillan who sold it to Mrs. J. C. Bennie in 1962. Mr. William Simpson and wife (Mary Watson) came to Canada from Ellon in Aberdeenshire, Scotland in 1846 and settled on this lot. They had 3 sons and 2 daughters, Margaret (Mrs. W. Marshall), Mary, Wm. (not married), James (married Marjory Clark), John (married Jessie McGeachy in 1886). On the death of Mr. Simpson in 1887, his son, John, inherited the farm. John died in 1891, leaving the farm to his widow and son, John Edward, who took possession in 1914. John Edward married Ida Mae McPherson in 1915. They had 5 sons and 2 daughters, Donald, Walter, Edward, Cecil, Ivan, Norma and Myrtle. In 1929, Fred Mast and wife, Mary (Scott) rented the farm and in 1944 purchased the same. Then in 1946, Douglas Gilmour and wife, Doris (Butler) purchased the farm. They with their family, Judy, Joanne, Robert, Susan and Kevin are the present owners. In 1856, these lots were owned by John and Wm. Martin. We note that in 1877 and 1881, parts of these lots were pur­chased by the Credit Valley Railway Company. Barney Mast, who had lived on the west half of Lot 33, Concession 8, purchased this property from the Martins in 1877. In April of 1896, the farm was taken over by his son, Charles. They had 2 daughters, Lou (unmarried) and Mae. They had 3 sons, Charles (m. Annie Tennant), Wm. (m. Dorothy Sirett), John (m. Grace Warren). John and Grace had a daughter, Muriel, and 3 sons, Glen Allan, Ray and Dale. They took over the farm in 1927. They rented to Thos. Hull and John Golden. In 1947, the farm was sold to Victor Mann. John Smith bought from Victor Mann in March, 1951 and is the present owner. He and his wife, Lucy (Fitzpatrick) have a son, Garry, and a daughter, Darlene. Another daughter, Donna, died at an early age. This land was settled on by Andrew McRobbie, one of the four brothers who settled on Lots 22 and 23, front and rear of 10 Concession. He took out the patent in 1854. He married Margaret Grey. Mrs. Wm. Kerr was a daughter and also Mrs. Stevenson, who lived at one time on this lot. John McLean purchased this lot, which was passed down to the son, Peter J. “Sr.”, and now Peter J. “Jr.” is the owner. Our earliest records show that in 1855, John Clark “Sr.” ­obtained this property from the Crown. John sold to Peter Clark in 1870. Peter, who was a lumberman, worked with George McLean. They had a lumber and grist mill in Morriston in 1856. This mill was burned in 1859. George went to Aberfoyle and built the present mill. In 1867, oatmeal from the Aberfoyle mill was sent to the Paris Exhibition and awarded a gold medal and diploma in a show open to world competition. Peter married Janet McCaig. They went west to Edmonton, where he died in 1903. In 1877, Peter sold to James Martin, who also bought Lot 28. People by the name of Campbell were known to be on this property but we have not been able to obtain any concrete information. We do know that they moved down near Milton, and Mrs. Chas. Elliot, who lived in Mountsburg, was a daughter. In 1877, Jas. Martin obtained this lot from the Crown. The Martin family was Donald, James, George and Penelope (Mrs. Archie Campbell). In 1895, Wm. Kerr and his wife, Margaret McRobbie, bought Lots 27 and 28 from the Martins. Mr. and Mrs. Wm. Kerr had a family of two sons and five daughters: John W., Andrew (not married), Mary (Mrs. Robert Cockburn), Janet (Mrs. Wm. Simpson) and Elizabeth (Mrs. Donald G. Hanning), Margaret and Katherine (not married). John W. took over the farm from his father. He married Allison Henderson; their family consisted of two daughters and three sons: Margaret, Wm. J., Ernest (Vineland), Irvine (in England) and Beth (Mrs. Geo. Pentelow). Hugh E. Cockburn, a grandson of Wm. Kerr, made his home with the Kerr family. He married first Jessie, and then Bessie Henderson. He has one daughter, Mary. In 1920, this property was bought by Alex McLean and Sons. On the death of Alex McLean in 1927, the farm was taken over by a son, Donald J., the present owner. In 1930, he married Maude Clark, their family: Lois, Robert, (married Jean Lowes: now living in British Columbia. They have two daughters, Debbie and Lori), Alastair (married Jean Copeland, now living in London. They have one son, John and a daughter, Nancy), Ian, Alan and Wilfrid. This lot, along with 30, was claimed for John and Alexander McLean, in 1831, by their older brother, Donald. When the brothers completed the task of clearing the land, they divided the land. Alexander took the corner, Lot 30, known as Spring­field, and John took the other, Lot 29, known as Viewfield. John McLean married Isabella McPherson (daughter of Linny McPherson) who died a young woman after contracting typhoid fever from a former hired man whom she was nursing. All except John McLean contracted the dreaded disease. Their family was Margaret (Mrs. Chris Moffatt), Annie (Mrs. John Kerr), Mary (Mrs. Robt. Kerr), Penelope (Mrs. Dan Mc­Farlane), Jessie (Mrs. John Hay), Elizabeth (Mrs. Fred Allison), Donald, who kept store at Ridgetown and Peter J. “Sr.”, who remained on the farm. He married Catherine Lamb. Their family: Isabella (Mrs. Dr. Wm. Gillies, Saskatoon), John George (m. Christina Clark), Peter J. (m. Agnes Cargill), Douglas (m. Hazel Bowman), Anna D. (Mrs. George Wilson, St. Mary’s). Peter J. married Agnes Cargill in 1925 and succeeded to the farm after his father’s death in 1927. Their family is: Marjorie (Mrs. Calvin Wigood), Peter Arnold and Ruth Catherine (Mrs. John Kelly, Toronto). Peter Arnold married Patricia Boyd and they, with their family, Susan, Bryan, Carol Ann and Arnold Peter, live on the homestead. This house was built in 1872. Peter J. and Agnes reside in a new house built in 1965 on the front of the old homestead. Alexander McLean came to Canada in 1833 at the age of 16 from Badenoch, Invernesshire, Scotland, with his parents Peter McLean and Margaret Martin. Their family was: Alexan­der, John, Peter, George, Penelope (Mrs. Peter Grant), Janet (Mrs. Fraser and then Mrs. Cockburn), Margaret (Mrs. Jas. Hanning), Ann (Mrs. Rev. Meldrum), and Donald (m. Margaret Cameron). They cleared and settled on above lot. He (Alexander) married Christina Cameron, daughter of Captain John Cameron and Annabella McLennan who came out in 1841 from Ullapool, Rossshire and settled near Crieff. There were nine children in this family: Dr. Peter, Annabel (Mrs. Hugh McDonald), Margaret (Mrs. Hugh Clark), Christina (Mrs. J. R. Clark), John C. (optician), Alexander, Penelope, Hannah (teacher, died in B.C. ), Donald (lawyer) and Jessie (Mrs. Gilbert Cockburn). Alexander succeeded to this farm. He was born in 1856 and died in 1927. He married Jessie Cameron from Flamboro. She was born in 1866 and died in 1959. Their family: Alexander C., Donald J. (m. Maude Clark), Peter C. (m. Gertrude Early), Kathleen (d) (Mrs. A. Hammersley, Saskatoon), Christina (Mrs. R. Sanderson), Wilfrid G. (d. 1945), Annabel (Mrs. H. Leachman), Margaret and Kenneth. There was an Indian burying ground on this farm. Alex III, Margaret and Kenneth still reside on this farm. Donald McLean, born in Badenoch, Invernesshire, Scotland in 1806 and died in 1851 at the age of 45. He came to Canada in 1831 in advance of his relatives. He took up 200 acres of land on Lot 31, Concession 9, where he had the first shanty of the district on the front of the lot. He was followed in 1833 by his father, Peter McLean and his mother, Margaret, who was a sister of Donald Martin. Their family was: Donald, Alexander, John, Peter, George, Penelope (Mrs. Peter Grant), Janet (Mrs. Fraser first and Mrs. Cockburn), Margaret (Mrs. James Hanning) and Ann (m. Rev. Wm. Meldrum). Donald married Margaret Cameron and their family was: Peter, Janet, Archibald (died in infancy), and James E. (died in 1935). Donald died in 1896. Peter married Christina McKenzie and lived on Lot 31, R. 9, where his father, Donald, moved to let his grandfather have the front 100 acres, namely Lot 31, Front 9. Their family was Donald A., Duncan (m. Margaret Clark), Margaret (Mrs. D. R. Clark). Donald A. married Emily Winder. They had three daughters, Christina (Mrs. John Clark), Stella (Mrs. Marquardt), and Alexandra (Mrs. Wm. McIntosh). When Peter died in 1905 the farm was taken over by his son Donald A. At the death of Donald A., in 1939, the farm was operated by his widow, Emily, for one year. From 1941 to 1943 the farm was rented to Malcolm Clark. In the spring of 1944, this farm was bought by Ingle and Myrtle (Hunt) Bousfield, the present owners. Their family: Ivan and Carl (m. Audrey Skerrit). Their family: one son, Jamie and two daughters, Katherine and Karen. In 1869, Donald McLean sold ½ acre lot on the north corner of this property to Geo. Hanning, who erected a house and blacksmith shop. He blacksmithed here for a number of years himself and also rented the shop to many others who carried on the trade. Some of these men were George Hanning, Thomas Weir, Hugh Fraser, Peter Clark and James Gilmour. In 1904, the blacksmith closed as such and the following year, 1905, Hannings sold this property to the Wm. Kerr family. They never lived there but the house rented to many different families. Among these families were Archie Smiths, Heffernans, J. P. McPhersons in 1912, Geo. McIntosh, Johnstons, Arnold McLean. In 1947, Mr. and Mrs. Donald G. Hanning retired from the farm to this property, which belonged to Mrs. Hanning. After their deaths, this house was sold to Mr. and Mrs. Carl Wingrove, the present owners. This is the first house on Lot 31, R. 9, built by Donald McLean in the early 1830’s. Although Peter Grant came to Canada in 1831, it wasn't until 1832 that he arrived in this section and chose this lot, and it wasn’t until 1846 that it was bought from the Crown. Grant, who was proprietor of Fernsdale Estate in Inverness, Scotland, named this lot “Fernsdale” and it always retained this name and later was registered as such by John G. McLean and Sons. Peter Grant married Penelope McLean and they had three sons, Peter, John and Donald. Peter Grant Sr. died April 13, 1881, and his wife, Penelope, on April 28, 1879. In 1890, Peter Grant had sold this lot to his son, John, a bachelor. His aunt, Mrs. McIntyre, kept house for him. John Grant farmed this lot until the late 1890’s when he had an auction sale and leased to Mr. McPherson until 1903. Mr. John Jones rented the farm until 1908. After his sale, the farm was rented to Mr. Stewart Bruce who remained until 1914 and on his moving to Eramosa Township, Mr. Alfred Freeman rented until 1919. John Grant went to live in another house on this lot across the road from Badenoch School, which had been built for “Granny Watson” and was later occupied by her son, Hugh. John Grant died September 8, 1919. In 1936, this house was sold by John G. McLean to Mr. James Watson who moved it to Arkell and today is occupied by Mr. Joseph Ellis. In 1867, a large pine log cut on this farm was shipped to the World’s Fair, Paris, France, and was awarded first prize. This farm was bought by Peter J. McLean Sr. in 1918 and possession was taken by them in 1919, being worked from Lot 29, Con. 9, until 1928 when his son, John George McLean, married Christina Clark and they took possession and farmed this lot with Lot 23, Con. 9, known as the “Black Farm”, which they also owned. In 1944, they bought Lot 30, Con. 10, known as the “Martin Place”. In 1957, the Department of Highways bought this farm for building of Highway 401, the MacDonald‑Cartier Freeway, and also bought Lot 30, Concession 10, as it was farmed with this. On June 1st, 1957, a clearing auction sale was held and on June 5th, 1957, the McLeans moved to Old Brock Road in Aberfoyle, where they had purchased a new house. After the Department bought this farm, the McLeans rented it back for a number of years until the highway was completed. The Department of Highways, taking 22 acres of the farm for the new highway, sold the balance of the property. Approxi­mately 30 acres were landlocked on the east side of the new highway and was sold with abutting Lot 33, and approximately 45 acres with the buildings on the west side of new highway was sold to Mr. Ingle Bousefield in 1963. While the Department still owned this property, the house had been rented to Mr. Roy Moore and later to Mr. and Mrs. Calvert Kitchen (Annabell Stokes), who still reside there. Their family: James, Morriston; Edgar, Douglas and Lois at home. Mr. and Mrs. John G. McLean have two sons, Ronald John McLean and Bruce Clark McLean. Ronald moved to Aberfoyle and lived with his parents until his marriage to Barbara Joan Skerritt. They built a new house in Aberfoyle in 1961 and live there with their three children, John Cameron, Maxine Joan and Bonnie Jean. Bruce, while still living on the farm married Helen Margaret Laking and they lived five years in Morriston and then moved to 329 College Ave. E. Guelph, where they live with their four daughters, Barbara Helen, Catherine Anne, Donna Marie and Sandra Christina. John G. McLean passed away at his home in Aberfoyle, April 27th, 1965. Mrs. McLean resides in Aberfoyle. In 1860, Robt. Clark obtained this lot from the Crown. He married Margaret McIntyre. Their family was: John R., Hugh, Duncan and Donald. In 1885, Robt. sold to John R. He (John R.) married Christina McLean. They had four daughters, Margaret (d), Mrs. Elmo Evans, Toronto), Christina and Robena (d) (twins) and Sylvia (d). Mr. and Mrs. J. H. Organ bought from John R. in 1910. Their family is Tom, Jack, Jim, Frank, William, Margaret, Mary and Ann (twins). In 1918, this lot was sold to Alex. McLean, who in 1919 sold to his son, Peter C.
Peter married Gertrude Early and they had 2 daughters, Jean (Mrs. Wm. Barker) and Betty (Mrs. E. McDonald), who have a son, Hugh; and two sons, Alexander who was killed in action in Holland in April, 1945. Russell married Mary Hughes and lives in Winnipeg. In 1956, Peter sold to the Province of Ontario for construction of Highway 401. For several years this farm was rented. Then, the Province of Ontario sold this lot and the part of Lot 32, south of Highway 401 to Mr. Len. Andrews and Wm. and John Laking. Wm. Laking and wife Ruth (Brinklow) with their family, Scott and Susan, live on the farm. In 1860, Angus Clark obtained this property from the Crown. Mrs. Neil Campbell, who lived on Lot 27, Concession 10, was a daughter. A son, James, was purported to have been Chief of Police in Winni­peg. Angus Clark sold to Robt. Clark in 1870. He in turn sold to Duncan in 1892, who in turn sold to Donald G. Hanning in 1901. Donald Hanning married Elizabeth Kerr. In 1917, Hannings sold to Mr. and Mrs. Alex Chisholm. They had one son, Noble (m. Jessie Fielding) and two daughters, Jean (Mrs. Howitt Stewart) and Margaret (Mrs. George Mc­Connell). In 1922, Geo. L. Sutton purchased this farm. Loammi Sutton (m. Minnie Land) and they had two daughters, Eleanor and Norma. In 1947, James and Beulah (Inglis) Kitchen purchased this property. Their family: Clare (d. 1947), Peggy, Patricia (Mrs. Ken Rice), Mary Helen, Janice and Gail. In 1955, Kitchens sold to John Allsop and his wife, Marjory McCready, who with their family, Janice and Neil, are the present owners. John Kennedy, one of the first six settlers to come to Badenoch, received Lot 35, Rear Concession 9, from the Crown. In September 1868, he sold it to Robert Kennedy who married Penelope MacPherson. They had one son, Donald and one daughter, Mrs. Donald Hanning. James Simpson bought this farm in April, 1883. He married Marjorie Clark. They had three daughters, Mrs. Duncan MacEdward, Badenoch; Bess and Marjorie of Guelph; and five sons, William of Brantford, James of Guelph, Peter of Flint, Michigan, John who died in infancy and Donald who remained on the farm. Donald married Annie McDonald in 1931. They had one son, Douglas of Guelph, and one daughter, Mrs. Ted Lucking of Kapuskasing. George Webb, the present owner, bought the farm in 1955. They have four children, Pamela, Beverly, Richard and Nancy. Lauchlan Kennedy was one of the first settlers to come to Badenoch. He settled on Lot 36, Rear Concession 9. His brother, John (Callie) Kennedy, lived with him after his return from California where he went in 1849 during the Gold Rush. Lauchlan married Mary McKenzie. They had 3 sons, John and Alexander, who moved to Red Deer, Alberta, and William who went to Oregon; and 3 daughters, Elizabeth (Mrs. Angus Martin), who moved to Red Deer, Alberta; Catherine (Mrs. Alexander MacEdward), Badenoch and Janet. In 1880, Andrew Foley of Morriston bought the farm. He rented it to John Smith, Joe Harmer and Stewart Bruce. In 1911, he sold it to Angus Martin. The Martins had 2 sons, Archibald and Neil, and 2 daughters, Jessie (Mrs. Robinson), of Kitchener, and Phemia. In 1928, Ernest Kitchen of Morriston bought the farm and sold it the same year to McMillan Elliot. Tenants during Mr. Elliot’s ownership were: Bill Mast, the Parchems, Bob Kennedy, Orren Buttenham and Carl Wingrove. In April, 1950, Andrew Gilmour bought the farm and sold it to his son, John in 1958, who with his wife, Norma, and children, Stephen, Bradley, Andrea, Diane and Patrick live there. In the year 1833, Wm. Clark with his family, and John Clark Sr., Peter McLean, Wm. Kennedy and families arrived in Badenoch Settlement, Puslinch, to take up land. Wm. Clark chose Lot 37, East Con. 9, Puslinch. His only son, Malcolm Clark, was killed in the States. In the year 1853, the Lot 37 was disposed of by the Crown to James Martin. In the year 1857, it was sold to Angus Martin. Then Robert Burdon had purchased the property and moved on to it with his family. Mr. R. Burdon had passed away and his widow, Margaret Burdon, took over and had possession until the year 1917. In the year 1914, Mrs. Margaret Burdon purchased Lot 38, East Con. 9, Puslinch, consisting of 27½ acres, commonly known as a gore. From the year 1914 until present it is known as 1 parcel. In the year 1917, Mrs. Margaret Burdon disposed of the land consisting of 127½ acres more or less to John A. Elliot, who had possession until the year 1957. John A. Elliot in the year 1957 disposed of the property to Clayton and Kathleen Warner. In the year 1959, it was disposed of again to Mary McPhail and June R. Andrews, and at the present they are the owners. Lot 38, East Con. 9, Puslinch, consisted of 27½ acres, more or less, which is known as a gore. Alex McLean obtained this lot in 1854 from the Crown. In 1856, he sold half of it to his brother, Peter. In 1858, according to records of the present owner, Alex McLean Jr., the first mentioned Alex gave the Council a right‑of‑way opposite this property in order to bypass “Loch Buie Pond”, for which he was to get 1/5 acre of the land, and retain ten pine trees, and $15.00. This property now belongs to Alex Jr.
Peter McLean, for the roadway on the front of his property, received $20.00. The property passed to Donald James and now to his sons, Gordon and Jas. D. For the corner taken from Lot 27, an allowance of $4.00 was given to the owners. Lot 27, Front Concession 10, Puslinch, was taken from the Crown by John McLean in 1844 and owned ever since by his direct descendants. John McLean was born in 1780 and his wife, Margaret McPherson, was born in 1782. They were married in 1820, and lived in the village of Inch, Invernesshire, Scotland, until 1844, when they immigrated to Canada, bringing their family of six children with them. They came by way of Dundas to homestead on Lot 27 of the 10 Concession, Puslinch Township. Of their six children, Angus, Donald and Christian remained on this farm until their death. James, the oldest son, was the first school teacher in Badenoch School, later he had the store in Aberfoyle. Grace married Alan McDonald who lived on Lot 31, on the rear of the 10th Concession. Marjory married John Buchanan and they lived in Burford Township. She died in 1864, leaving a family of four young children. They came to live with their grandparents on Lot 27 after her death. Elizabeth, the youngest girl of the family, lived here until she died in 1932. Thomas, the only son, also lived here until he was married in 1892 to Mary Anne Martin, when he built another house on this farm. They lived there until 1900, when they moved to Lot 35, on the 11th Concession, this farm having been willed to Thomas by his uncle, Angus McLean. They had four children, Angus, Duncan and Marjory were born on Lot 27 and Mary on Lot 35. The farm Lot 27 was operated jointly by Thomas and his family together with Donald and Christina for several years, Angus spending most of his time here and at Donald’s death, the farm was willed to him. Angus married Grace Mitchell in 1930 and lived here until his death in 1943. They had two children, Alexander and Mary. Grace continued to operate the farm with the help of her brother‑in‑law, Duncan Buchanan, who still resides on this farm. Mary married Norman Tosh in 1955, and they purchased the farm from her mother in 1960, where they now reside with their five children. This is the sixth generation on this farm. Daniel Campbell was born in Invernesshire, Scotland, settled first in N. Easthope and later in Puslinch, and was one of the early settlers. Their family was Archie, John, Donald, Duncan (who was drowned), and Mrs. Robert Shields. Donald succeeded to the home place where he was raised. He married Mary Ann Hanning. They had one son, Wilfrid D.
When Donald died in 1934, the farm passed to Wilfrid D. He married Olive Arrowsmith and they had one daughter, Barbara, (Mrs. Ed. Crimless). In 1951, Wilfrid sold the farm to Donald G. Hanning and moved to Guelph. The farm was operated by the Hanning family until the death of Robert D. in 1955. The farm is now owned and operated by Ivan, a grandson of Donald G. Since the Hannings took over the farm, there have been several tenants in the house. At present, Mr. and Mrs. Mike Gulak and family live in the house. At one time a sawmill operated on this farm. Donald McLean on Lot 31, R. Concession 9, picked for his brother, George, Lot 29, F. Concession 10. George did not want to farm so the property was transferred to their sister, Margaret (Mrs. Jas. Hanning). Their family: Donald, George, Joseph, James, Peter, Pennie (Mrs. John Stewart), Margaret (Mrs. J. McFarlane), Agnes (Mrs. Malcolm Kennedy), Jennie (Mrs. McDonald) and Mary Ann (Mrs. Donald Campbell). The farm was owned by Joseph Hanning and later by George Hanning. In 1904, this farm was bought by Thomas Foley. His mother, father and brothers, Wm., John, Fred, who was killed overseas in the first world war, and nephews Charles and William lived with him. In 1940, Archie and Mary (Clark) Scott bought the farm. Their family is Peggy (Mrs. Ivan Taylor) and Helen (Mrs. Paul Cushing). In the spring of 1953, after the death of Archie, the farm was sold to Wm. Forbes and son, John. John and Jean had a family of four sons and three daughters. Wm. Forbes sold the property in 1964 to Mr. Day. Mr. Day sold the buildings and twenty acres to Wm. Hammond and Mary (McManus), the present owners. Their family: Billie, Richard, Shawn and Jen­nifer. The remainder of the farm still belongs to Mr. Day. Lot 30, Concession 10 was bought by John Martin and his wife, a Miss McPherson, from the Crown in 1873. On his death, Mrs. Martin and her son, John, lived on this farm until her death. Then in 1880, their son, Duncan Martin and his wife, Mary Smith came into possession of it. In 1906, Lot 30, Concession 10 was bought by Thomas Foley and in 1940 was purchased by Mr. and Mrs. Thomas C. Amos of Moffat; Mrs. Amos, the former Marjorie Buchanan, being a direct descendant of the Martins. In 1944, it was pur­chased by Mr. and Mrs. John G. McLean and was in their possession until 1957, when it was sold to the Department of Highways of the Province of Ontario. The Province later sold it to Mr. John Boyd, the present owner. John Campbell was a shoemaker, and lived on this lot where the Badenoch Park is now situated. It was here that the open-air Church services were held, across the road from the old black­smith shop. The Duncan Martin family lived on this lot. The buildings were situated on the front centre of the lot. When it was decided to build a second school more centrally located for all the section, the southern corner of this lot was chosen as the most suitable site. The third school, now our Community Centre, was built farther back on this same lot in 1889. The Martin family was 5 daughters, Jessie (Mrs. Bruce), Mary (Mrs. Buchanan), Maggie (Mrs. Trimble), Ellen (Mrs. D. J. McLean), Effie (Mrs. Donald Stewart). Mrs. McLean still lives in the section, and 4 sons, John, Donald, Neil and James, still live in the section. In 1915, Thomas Foley bought this farm. Wm. Black and wife, Mary (Buchanan) bought Lot 31 in 1940 and sold to the Government in 1945. In 1946, Wellington County reforested the front part of this lot. The west corner was reserved as a ball park. 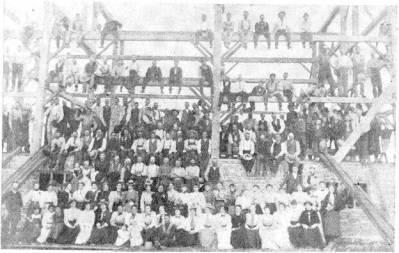 The stands were installed in 1950. On October 19, 1951, a delegation met with the Reforestation Authority and for the sum of $1.00 obtained a fifty year lease on the said park. A suitable marker has been erected by the Women’s Institute on the corner of this lot. In 1858, Robert Forbes obtained this lot from the Crown and sold to Alex McLean in 1897. Wilfrid McLean became the owner in 1930. In 1963, the McLean Estate sold to the Twelve Mile Creek Conservation Authority. In 1859, this property was acquired from the Crown by Robert Forbes, who in 1900 sold to Alex McLean. In 1930, it was taken over by Peter C. McLean. The Province of Ontario bought this lot from Peter C. McLean in 1956 for the Highway 401. In 1833, Linderman’s Mill was built by Daniel Linderman and his father, John, on Lot 35, F. Concession 10. Later, it was purchased by Forbes of the Hespeler Mills. On this property there was also a heading and shingle mill owned and operated by John McFarlane and later by James Laking, who with his wife, Annie McPherson, and daughter, Edna, lived here. In 1900, J. P. McPherson purchased these two lots and rented the heading mill. He married Sarah Burdon. They had 3 daughters, Margaret, Catherine and Annie. After the death of Sarah, he married Margaret McDonald. In 1912, Donald G. Hanning bought the farm. He married Elizabeth Kerr. They had 3 sons, William, Robert (d), and Donald of Port Credit; and 3 daughters, Phyllis (Mrs. Orrin Buttenham, Rockwood), Grace (Mrs. Finn, Milton), and Mary (Mrs. Frank Elliot of Badenoch). William is still on the farm. He married Gladys Clark. They have 4 children, Ivan and Bill at home; John, Wyoming; and Gladys (Mrs. Neville Kennedy), Guelph. The Gilmour family lived in a house on the jog of sideroad No. 35 between Con. 10 and 11. Andrew Gilmour married Elizabeth MacEdward. They had nine children: Mary (Mrs. Wm. Frank), John, James, Jean (Mrs. Arthur Brooks), Andrew, Edith (Mrs Joseph Frank), Elizabeth (Mrs. Wm. Taylor), Cassie (Mrs. Charles Watson), Elsie (Mrs. Edgar Boucher). The first house burned and was rebuilt in 1902. After the Gilmours moved to East Flamboro, about 1906, Bonus and Harris lived here. In 1921, Dan McIntyre moved the house to his farm to replace his that had burned. Robert Forbes received Lot 36, Front Concession 10 from the Crown in 1859. He also purchased and ran Linderman’s Mill. In 1871, he retired to Guelph. Malcolm Kennedy purchased the farm in 1883. He was married to Agnes Hanning, They had no family. In 1900, they sold the farm to Thomas Beaton and retired to Morriston. Thomas Beaton married Mary MacEdward. They had three daughters, Myrtle (Mrs. Elmer Zimmerman, Milton), Mrs. George Rollins, and Velma, R.R. No. 2, Campbellville. The farm was purchased by the present owner, Robert Hunter, in 1953. They have two children, Leslie and Joan. It is thought that an Indian Burial Ground was located here, as many Indian relics have been unearthed. A Charcoal Kiln was built and operated by Dougald Lamb. Mr. and Mrs. William Finlay purchased 10 acres and built a home here. The northeast part of the farm was sold to the Conservation Authority to be used as part of the reservoir of the Mountsberg Dam. Duncan MacEdward came to Canada with his family from Invernesshire, Scotland in 1833. He had 4 sons, Donald, James, John and Thomas, and 4 daughters, Mrs. Donald Kennedy, Mrs. James Kennedy, Mrs. James Gordon and Mrs. James Martin. He lived with his son, James, who received the Front of Lot 37, Concession 10, Puslinch, from the Crown. This is one of the few farms in Badenoch that has remained in the possession of one family. The present owners are the fifth generation to have lived here, and their four great grand­fathers, Lauchlan Kennedy, James MacEdward, William Simpson and Donald Clark were all early Badenoch settlers. James MacEdward married Mary Kennedy; they built their stone house in 1862. They had 4 sons and 3 daughters. Duncan, who went to California; William, who moved to Muskoka, James to West Flamboro, and Alexander who remained on the farm, Mrs. Andrew Gilmour, Badenoch, Mrs. John MacFarlane, and Mrs. Rory Murray, Minnesota. Alexander married Catherine Kennedy in April, 1876. They had 3 daughters and one son: Mrs. Thomas Beaton, Badenoch; Mrs. Albert Hewins, Mountsberg; Mrs. Alex MacIntyre, Guelph and Duncan, who remained on the farm until his death in 1962. In 1903, they purchased the Front of Lot 38, Concession 10 from Alex. Sinclair. Duncan married Margaret Simpson in 1911. They had 4 daughters: Aileen, Margaret and Helen, who are still on the farm and Mrs. James Douthart, R.R. No. 2, Hamilton. In 1965, The Halton Conservation Authority purchased 88 acres as part of the reservoir for the Mountsberg Dam. In 1912, Alexander built a second house on the farm, where they lived until 1938. Since then the house has been rented to John Mast, Ray Collard, Wynn Taylor, Vic Sheverman, Angus Ainslie, Cal Kitchen, Ken Stokes and Don Stokes. Our first records note Jas. McLaren and his wife Margaret Stewart lived on this property. They had a family of three sons and four daughters: Peter (m. Mary Anderson), Mary (m. Walter Lillico), Kenneth (m. Annabel Harmer), Catherine and Margaret (unmarried), Jos. in Chicago and Helen (m, Jos. Little). He sold the farm in 1883 to John McKenzie and moved to Drumbo. John McKenzie married Annie Clark (daughter of Donald Clark) in 1880. They lived first on Lot 24, but moved to Lot 26 in 1883. They had two daughters: Margaret (Mrs. R. T. Amos) and Annie (Mrs. Robt. Murray). In 1917, John McKenzie sold to his son‑in‑law, R. T. Amos and moved to Moffat, where he died in 1933. R. T. Amos sold to Mr. McCallister in 1944 and moved to Guelph. The Amos family: Helen (Mrs. Wm. Jones), Annie (Mrs. Ivan Richardson), John died in 1935, Ruth (Mrs. Ray Blacklock) and Walter married Wanda Elliot. Mr. McCallister removed the bush and in the same year, 1944, sold the property to Harry Dunkie. In 1953, Harry sold to Wm. Joukema and moved to Guelph. Mr. Joukema has four daughters. In 1965, the property was sold to Mr. J. Postma. Mr. Postma with his wife and family of two sons and one daughter are the present owners and reside here. Dougald Campbell and wife, Mary, came to Canada in 1834 from Argyle, Scotland and settled on the above lot. They had a family of eight daughters and four sons. They were: Peter, Charles (who went to Luchnow), Neil, Archie, Mary, Jane, Janet, Christine, Margaret, Anne, Katie and Belle. He farmed this property until his death in 1852. His son, Neil, at the age of 12, took over the farm. In 1866, Neil married Helen Clark (daughter of Angus Clark); they had a family of five daughters and three sons. 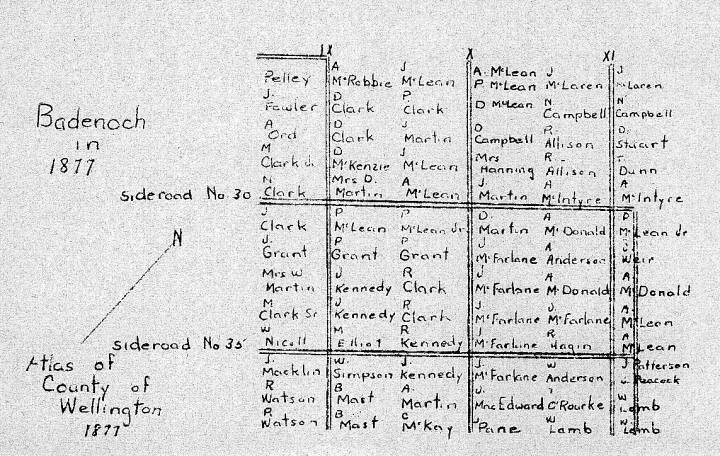 Their family: Jessie (Mrs. Neil Campbell, Luchnow), Ellen (Mrs. Archie Smith), Mary (Mrs. Angus Martin), Katie (Mrs. W. Clark, Manitoba), Dougald, Margaret, Peter and Angus (twins) were not married. In 1922, at the death of Neil, age 82, the farm was taken over by Dougald; Margaret, Peter and Angus lived with him. They retired to Guelph and sold the farm to Mr. Perkins. He in turn sold to Messrs. Nicholson and Marshall. By the Atlas of 1877, we note J. Little on this property. Two sons, Rev. John Little served in Ontario, Rev. Andrew Little served out west. Another family member was Joseph Little, who farmed in Nassagaweya and owned gore 32 in Puslinch on the 11 Concession. There were several daughters as well. Thomas Clark bought this lot. His wife was Maggie Smith. They had 3 children: Thomas, Wm., and Sarah (Mrs. Crozier). On the death of Thomas Clark, this property was owned by George Amos, who in turn sold to Archie Gillies. Archie sold to Joe Moore, who in turn sold to Duncan Buchanan and Donald McDonald. In 1957, they sold to the present owner, Mr. Cryderman, who has developed fish ponds and a hatchery on what is known as Rainbow Ranch, this being the headwaters of the 12 Mile Creek, leading to Mountsburg Dam. This lot has always been part of the front lot, commonly known as a string hundred. By the Atlas of 1877, we note the name of R. Allison. By the Atlas of 1877, this lot belonged to A. McIntyre. Previous to 1893, Morrisons and Kennedys lived on this property. In 1893, John Fritz, a son‑ in‑law of A. McIntyre, received the Crown deed for this property. In April of 1905, this lot sold to Orman Patton. After the death of 0. Patton, Donald McDonald and Duncan Buchanan purchased this farm in 1950. In 1953, they sold the building and a small parcel of land to Ben Beavis. Mr. and Mrs. Beavis and their family, Dianne, Susan and David still own and live on this property. In 1872, Allan McDonald got this lot from the Crown. In the year 1874, Mrs. Donald MacDonald (no relation to Allan), the former Mary McPherson, came to Canada from the Parish of Laggan, Badenoch, Invernesshire, Scotland, with her family, Alexander, Angus, Emily, Allan and John. They took up the land on Lot 31, Con. 10 of Puslinch. Donald MacDonald, son of John, owns this farm now. In 1860, John McDonald obtained this lot from the Crown. He sold to Mr. Hatch. In 1864, Mr. Hatch sold to Geo. Anderson. In 1893, John MacDonald (no relation to the above John McDonald) purchased Lot 32 on the 10 Concession from Geo. Anderson and took up residence there with his wife, the former Georgina Fletcher from Marybill, Glasgow, Scotland and lived there until he passed away in January, 1919 in his 63rd year. His widow continued to live on this property with her family, Mary of Guelph, Emma (Mrs. Wm. 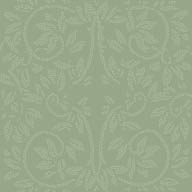 MacIntyre, Acton), Georgina (Mrs. James Simpson, R.R. 1, Moffat), Beatrice (Mrs. Dr. T. R. Pickard, Guelph), Annie (Mrs. Donald Simpson, deceased of Guelph), Elizabeth (Mrs. Wm. May, on Lot 33, Con. 11, Puslinch), and Donald, who took over the farm where he now resides. Mrs. MacDonald passed away at the old homestead in her one hundred and first year on December 5th, 1966. In 1934, Donald married Ellen Tardif from Englehart. Their family is John (m. Ruth Osburn, Toronto), Emily (Mrs. Archie McRobbie, Winnipeg), Ronald (m. Linda Jarvis), Donald (m. Linda McIntyre), and Betty at home. On April 29, 1875, Allan MacDonald received the Crown deed. On April 16, 1881 Mr. MacDonald sold to William Cowan. In November 1901, William Cowan sold to William Moore. Mr. Moore built the house, which still stands. On February 20, 1911, William Moore sold to Thos. Buchanan, who died in November of 1940. It was left to his son, Duncan Buchanan. In 1944, the barn burned. On May 1st, 1945, Duncan Buchanan sold to Charles Inglis. Douglas Inglis was a tenant in the house until April 18th, 1947, when Chas. Inglis sold to Russell Inglis, who is the present owner. Their family is Eileen (Mrs. John Cockburn, Brampton), Florence, Larry (m. Shirley Stalibrass, Exeter), Ronald and Robert. In 1948, another barn was built. This barn was purchased from Mr. Mon. Nixon of Milton. Russell Inglis tore this barn down and trucked it to this farm where it was re­built again. John Smith bought Lot 34 in the early 1870’s. His sister, Effie, and his mother came to live with him sometime later and remained there until they died. John married Emily McDonald, they had one daughter, Effie B. She lived there after her parents’ death and in 1936 Duncan Buchanan bought the farm. He still owns and farms it. In the late 1850’s, the Smith family came over from Islay, Scotland and settled on Lot 35. Neil Smith and his wife, Mary, had eight children. They lived here until about 1890 when the farm was sold. Subsequent owners were William Carton, Jacob Allison, Colin McLennan, Dan McIntyre, Stan Williams, Stuart Bruce and his sons, Scroggie, Donald and Bill, who sold it to Ray Varley, who now lives there. James Gordon received Lot 36, Rear Concession 10 from the Crown in 1856. He married Christine MacEdward. They had one daughter, Elizabeth, who married Hugh Watson, and lived in a second house on the farm. They had three children, Hugh, Mary (Mrs. Henry) and Tena (Mrs. Elmer Gould). The farm was sold to Wm. Anderson in 1883 and to Joseph McIntyre in 1905. The present owner, James Martin, bought this property in 1912. He married Margaret McLennan. They had a family of three, Mrs. Bert Lowrey, Lindsay; Mrs. Lorne Newell, Carlisle and Alexander, deceased. Alexander married Florence Lowrey. They have three children, Mrs. John Jarvis, Guelph, Gary and Billie at home. Through the years, a second house on the farm, which later burned, was rented to Mr. John Gilmour, Mr. Heffernan, Mr. Ridgeway and Mr. Stuart Bruce. The Department of Highways purchased the north corner for No. 401 Highway, and the Conservation Authority, the west corner, to be used as part of the reservoir for the Mountsberg Dam. In 1877, T. O’Rourke was living on this lot. Then Angus MacDonald, who came to Canada in 1874 with his mother, sister and brothers, bought it. In 1892, he married Mary Anderson. They had a family of four, Donald (d), Thomas (d), Rebecca and Mary of Morriston. In 1904, they bought Lot 38, R. Con. 10 and Lots 37 and 38, Con. 11, from W. Lamb. After their father’s death in 1915, the family carried on until 1962, when they sold to the Halton Conservation Authority. According to the Wellington Atlas of 1877, on Gores along the town line and Nassagaweya from Lot 26 to 38 inclusive, we find the following names: J. McLaren, N. Campbell, D. Stuart, T. Dunn, A. McIntyre, P. McLean, J. Weir, A. MacDonald, A. McLean, R. Hogin, J. Patterson and J. Peacock jointly on Lot 36, and W. Lamb on Lots 37 and 38. By the present day map, you will find different names on the various lots. Some have dwellings of which you will find an account elsewhere in the book. Lots 33, 34 and 35, Concession 11, Puslinch Township, settled on and owned by William and John McDonald in the early 1840’s. They were brothers of Allan McDonald, who lived on Lot 31. Neither William nor John was married, so on their death those farms were willed to Allan. When Allan retired in or about 1870, he sold Lots 34 and 35 to his brother‑in-law, Angus McLean. At his death, in 1894, it was willed to his nephew, Thomas Buchanan, and on his death, in 1943, it was willed to his son Duncan, who still owns and farms it. John McDonald lived on Lot 33 until his death in the eighties. Then Jim McPherson lived there for a few years, and later William Service, Robert Kennedy, Walter Bartlett and John Clifford. At John Clifford’s death in the early twenties, this Lot 33 was bought by Thomas Buchanan, who, on his death, willed it to his son, Duncan, who still owns it. Duncan sold the house and three acres to William May, who still lives there. He married Elizabeth MacDonald. They had 2 children, Donald, of Guelph, and Marion, deceased. William built a second house and sold it to Mr. and Mrs. George May. They have one daughter, Beverly of Toronto. Frank Small (m. Margaret Inglis) lives on Lot 35. They have 6 daughters, Irene (Mrs. George Locker, Guelph), Ruth (Mrs. Frank Beghetto, Guelph), Mary (Mrs. Ed Gamble, Guelph), Marguerite (Mrs. Cliff Boles, Burlington), Faye (d), Marjorie (Mrs. Larry Ewins, Guelph), and one son, Charles, at home. Pearl Schwartzenberg lives on Lot 28, Concession 11. Before this, Mr. and Mrs. John Peer and family lived here, also Archibald Campbell. In 1877, Walter Lamb owned these lots. He married Janet McNair. They had 5 sons, George, John, Dougal, Donald and Gideon and one daughter, Catherine (Mrs. Peter McLean). In 1904, these lots were sold to Angus MacDonald. We, the Committee, who are responsible for the publishing of this booklet, wish to extend our thanks to all those who, in any way, have helped compile this book. Any errors or omissions are unintentional and deeply regretted. As you will understand, we have tried to cover a very large span of time, and our information is what we have been able to read, and learn from happenings, which were recorded in the past, and those which have been handed down by the older to the younger generations. Our aim has been to link the past with the present so that the future generations may know and relive the progress from the time the early settlers first set foot on the uncleared land, to the present modern age. We hope that someone among the future gene­rations will see fit to continue our efforts so that those who follow may know something of the history of Badenoch, in Canada.